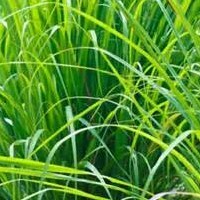 *Palmarosa Essential Oil has antiseptic properties as well as antiviral, bactericidal, cytophylactic, digestive and febrifuge. Mostly, the oil is used as a flavoring agent or additive to anything from food and beverages to soaps, perfumes and cosmetics. It is very popular in treating bacterial infections of the genito-urinary tracts, bye bye UTI! I came across this oil and it’s uses out of necessity and a dash of cosmic alignment. A few days ago I noticed a sore spot along the underside of my tongue and realized I had quite a cyst going on. Either a mucocele or an oral ranula, it is generally nothing to worry about. 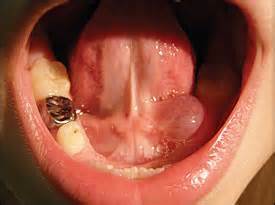 Here’s an example of an oral ranula (this is not my mouth). My ranula is about 1/4th the size. After extensive online research, it put me at ease knowing these things can spontaneously appear and disappear but are most likely caused by a salivary duct blockage. So, until I can get in to see the doctor (as it’s not life threatening) I decided it was time for a little self-treatment! Various articles suggest using Tea Tree Oil but unfortunately I don’t have it in my collection – YET. However, one article on mucoceles/ranula did note the use of Palmarosa Oil in treating swelling caused by salivary duct blockages. Low and behold – what do you think came in my order this month?! Yes! <– This is the cosmic alignment I was referring to! As I’ve found with many essential oils, you need to brace yourself for the flavor as they are intense! After applying one drop from my finger to the ranula, this particular oil took me a minute to savor. The taste I imagine is similar to licking the bottom of my Grandmother’s bathtub after flower-scented Calgon took her away. There’s a mental picture for you. Once you get past the flavor you start to feel a tingly burn, nothing too crazy. My mouth watered like crazy about 30 seconds after application under the tongue. I believe this is merely one reason why Palmarosa may be effective in reducing salivary blockages. The more saliva you make, the faster any blockages can be pushed through the duct. The oil slowly made it’s way around my mouth as I couldn’t help but expel the excess spit that was forming. The tingle then evolved into a warm numbing sensation. My first thought was how great this would be for those who have canker sores or cold sores. If you suffer from either, you may want to give it a try! In any case, I will have to update you after a weekend of trying this alternative treatment. I’m crossing my toes it works! In the meantime, try out this nourishing body oil recipe. Palmarosa Essential Oil is not typically suggested for internal use. Please consult your physician if you are currently on any medications. For topical use, it is best to use it in a diluted state with a carrier oil. Use caution if using it neat (undiluted) as it does tingle. And…as always, do your research and use only pure, high-quality oils backed by an upstanding producer. My ranula has shrunk and is back to normal! I will still bring up this issue with my physician at my annual checkup later this month…just in case! Palmarosa and Frankincense save the day once again!